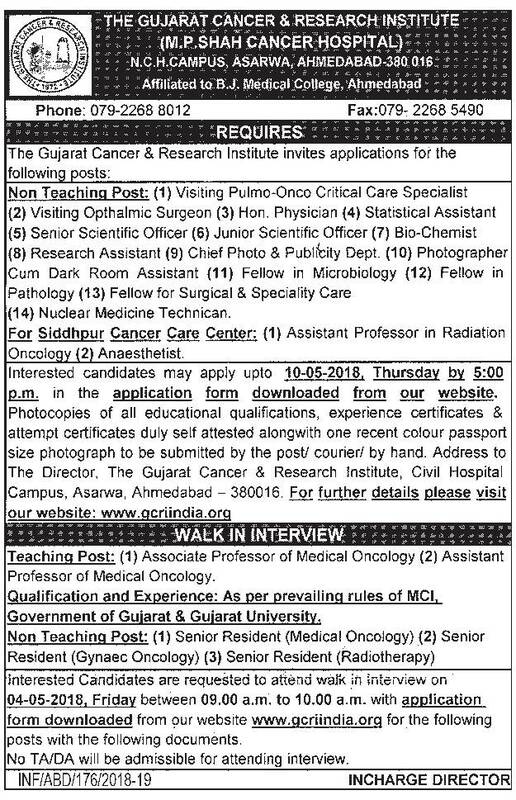 GCRI Recruitment for Teaching & Non Teaching Posts 2018 ~ :: GujaratGk :: Official Site :: Gujarat's No. 1 Educational Website..
• TEACHING POST: Interested Candidates are requested to attend walk in Interview on 04-05-2018, Friday between 09.00 a.m. to 10.00 a.m. with application form downloaded from our website www.gcriindia.org for the following posts with the following documents. • NON – TEACHING POST: Applications are invited for Para-Medical positions: Interested candidates may apply upto 10-05-2018, Thursday during office hours in the application form which can be downloaded from our website. Photocopies of all educational qualifications, experience certificates & attempt certificates duly self attested along with one recent color passport size photograph to be submitted by the post/ courier/ in person to The Director, The Gujarat Cancer & Research Institute, Civil Hospital Campus, Asarwa, Ahmedabad – 380016.